Can you define something that you feel you want that isn’t tied directly to your Knower/Judger? That wouldn’t be satisfying some ego need? It’s tough, isn’t it? Money? Car? House? Relationship? Then what could I “want” that’s not ego-gratifying? I almost certainly can place almost any material acquisition (money, car, home, collector item) as well as any political position (promotion in my workplace, election to leadership in volunteer group) squarely in the K/J, ego-based camp. They sound innocent enough—Who doesn’t want a nice new car?! And when I ask myself why I want that car, it usually comes to comparing my ride with someone else’s. Uh-oh. Sounds pretty K/J to me. Money seems to be the metric of our existence. Why do I want more money? So I can buy things that improve my comparative position among my observers (peers, neighbors, etc.). I might even fool myself a little into thinking I can use more money for charitable endeavors. And that works so long as my contributions are anonymous. But make it known that I made that contribution and voila! Back to ego-driven K/J responsiveness. I had an agenda for making that contribution that’s on another level, beyond just the contribution itself. 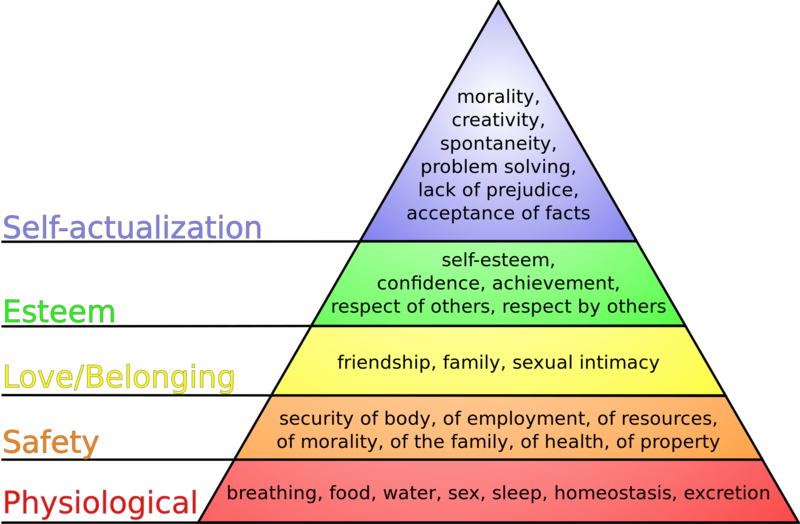 Let’s look at money on Maslow’s Hierarchy of Needs (not wants). Money can, indeed, fulfill the two most basic needs on Maslow’s list: physiological (for food, water, warmth, rest) and safety (security, safety). 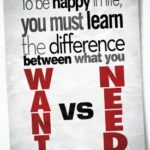 And it can certainly contribute to the next two needs, belongingness and love (intimate relationships and friends), and esteem (prestige and feelings of accomplishment), although my personal belief is that while esteem is usually purchased through currency or its cousin, time, belongingness and love purchased is frequently fleeting and temporary… sometimes outbid by others. When we have accommodated these four of Maslow’s needs, we’re left with self-actualization (achieving one’s full potential, including through creative activities). It’s my experience that these are rarely purchased, although an investment in presence is valuable. If it’s one of the baser four elements of Maslow’s Hierarchy, there’s every possibility that this is a learned “want”—one that I believe I want simply because I’ve been taught that and it’s my K/J rule. The purity of self-actualization, of going beyond what I’ve been “programmed for” and accomplishing more than I (or my teachers) thought I could accomplish is the WANT in uppercase letters that can drive me to try things I wouldn’t otherwise attempt. And I wouldn’t otherwise pursue that want if I didn’t believe the other four elements were addressed. 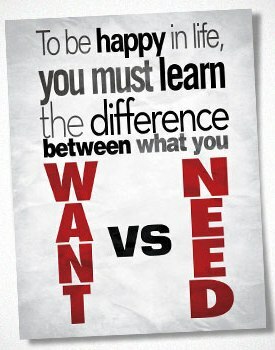 See how do self-actualization and want pair up? Satisfying the other four appears more like a need (part of my K/J rule set) than a want. In order to really pursue wanting something, according to Maslow, then I have to believe I am physiologically accommodated, safe, loved, and feel really good about myself. To me, that makes sense. 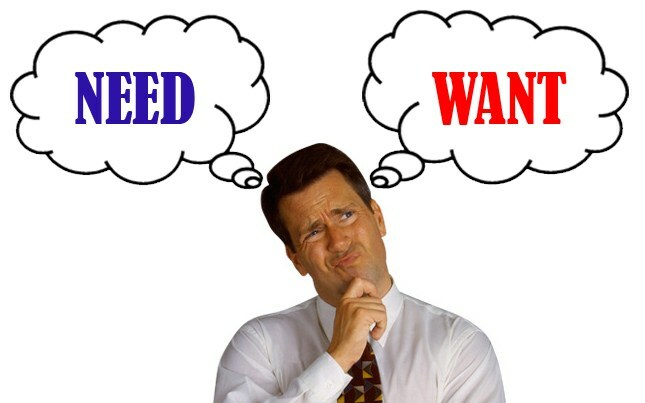 Why do you want what you want? Are you cleared to pursue it?